Today we celebrate another year in the history of the Trinidad Muslim League. Today we mark the 50th Anniversary of the League, which was founded on the 15th day of August 1947. In order to remind ourselves of our historic past I would like to highlight a few significant milestones as we moved along our rugged path. The Founding fathers of the Leaguewere the late Al Haj Moulvi Ameer Ali (Mufti), the late Mohammed Hakeem Khan and the late Mohammed Rafeeq (May their souls rest in peace). I have deliberately omitted the cause and sequence prior to the coming into being of the Trinidad Muslim League, which although very interesting, may be documented at some later date. On the 21st day of April 1950, the League was incorporated by Act of Parliament as No. 26 of 1950, to represent the Ghair-Mukallid (Non-conformist) Muslims of Trinidad & Tobago. A Ghair-Mukallid (non-conformist) Muslim is one who does not wholly and totally accept the doctrines and rulings of any ONE of the four recognized Imams of Islam: namely: Abu Hanifah. Malik. Shaffie and Hambal. As we reflect over the first decade of the League’s existence we recall the enthusiasm, the fervour and the energy manifested by the early members, who spared no effort in propagating the creed of the League, that there was no “kafir-making” in Islam. So long as one declares his faith in the Holy Kalima “La ilaha illalla Muhammad ur Rasul ullah” (There is no God but Allah and Muhammad is the Messenger of Allah)” one instantly becomes a Muslim and a member of the UMMAH of Rasulullah (ﷺ). In a short period of time the name of the League became a household word throughout the length and breadth of Trinidad. The League had now settled down to plan the construction of a suitable mosque at our Headquarters, now called TML Centre. This was the most trying period of the League. Money was scarce, and every kind of fund-raising venture was introduced viz. cinema shows, excursions, tea parties, Eid collections, bazaars etc. This was the period when the !ate Mohammed Rafeeq introduced the League’s Stabilization Fund, and in one of our Bazaars, he introduced “the Money Tree” at the entrance of the gate, where every member who passed through the gate contributed their share. But the most striking of all was when things really got tough; a call was made for more funds and the Ladies of the League shed their gold necklaces, earrings, rings and what have you, and placed them in the hands of our exchequer. Such was the dedication of the women and men of the League. On Sunday 25th of April 1954 the doors of the Jinnah Memorial Mosque were opened for worship to Al1ah. It was a grand affair, which was held under the Distinguished Patronage of His Excellency the Governor, Sir Hubert Rance, K.C.M.G., C.B.E. The formal opening was under the Chairmanship of the Honourable Albert Gomes, Minister of Labour, Industry and Commerce. The first Azan was given by M. Yarcub Khan (Curepe) and the Asr Salaah was led by Al Haj Moulvi Ameer Ali. I give these details because to me it was one of the greatest periods in the League’s history. At this period our enthusiasm was high and we looked to the future with great expectation. 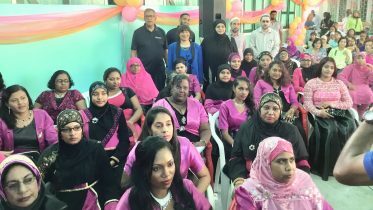 We had a dynamic Ladies Movement working side by side with our male members, organising function, banquets and taking part in all activities. There was a strong Youth Movement in the League. At this time we had established the San Fernando TML School which was housed at the Prince Albert Street Mosque Hall, through the kind permission of the San Fernando Mosque Board. The Libertville TML School was on stream. In our early stages we contributed to the Pakistan Refugee Fund and through the Red Cross Society we contributed to the Antigua Hurricane Fund. With our broad based philosophy we accommodated several Muslim Missionaries from Pakistan. In 1948 His Excellency M.A.H. Ispahani [Pakistan’s first Ambassador to the United States, from 1947 to 1951 -ed]. laid the Foundation Stone of the Jinnah Memorial Mosque. Maulana Bashir Ahmad Minto [missionary of the Lahore Ahmadiyya Anjuman in USA-ed] and Maulana Abdul Haque Vidyarthi Issa; Pakistan’s Ambassador to Brazil also visited. Moving along the second and third decade, the band-wagon of the League had touched every district throughout the Country preaching the ideologies of the League as well as forming Branches. By this time the League had no less than sixteen Branches and groups affiliated to it. During 1957 the St. Joseph TML School opened its doors in the old Mosque Hall which had been converted into a Government assisted Primary School. Somewhere in the sixties or even earlier, the then President-General Al Haj Aziz Ahamad had brought down Maulana S.M. Tufail, Imam of the Mosque, Woking. England an Ahmadiyya Missionary to Trinidad. Maulana Tufail opened Quranic Classes, introduced inter-faith meetings and generally taught Islam with an Ahmadiyya bias. an affiliate of the Ahmadiyya Anjuman Ishaati-Islam of Lahore, Pakistan. This created a sort of a division in the League as several members, mainly from the St. Joseph Branch, were opposed to this affiliation. During this period the League carried out several Seminars, Jalsas and other activities with an Ahmadiyya slant. To this building was added what we called “The Tent” (because of its shape) and which was again supervised by Al Haj Nazeer Mohammed. These buildings were designated “The Magnificent Two”. Another land-mark in the history of the League is our new School building which we formally opened on 24th May 1984. Credit must be given to Brother Amral Khan who supervised the construction of the building and to Al Haj Nazeer Mohammed who further enhanced its design. The formal opening of the school was handled by the then Principal Asad Muradali and Vice Principal and P.R.O. of the League, Brother Rasheed Allaham. The T.M.L. Centre now houses (a) Rafeek Memorial Secondary School (b) Kitchen Facilities (c) Administrative Office (d) Conference Room (e) Counselling Room and (f) Science Laboratory. The Magnificent Three” comprising The Primary School, The T.M.L Centre and the Jinnah Memorial Mosque are all located on the League’s compound, Eastern Main Road, St. Joseph. The question of Muslim Unity or Unity among Muslim Organisations was preached for a number of years but never became a reality. During the last decade this situation was rectified and the Muslim Co-ordinating Council of Trinidad & Tobago was formed, comprising the Anjuman Sunnatul Jamaat Association, the Tackveeyatul Islamic Association and the Trinidad Muslim League, and recently, the United Islamic Organisation. Abdul Aziz Memorial Mosque, in California the Wajdally Memorial Mosque, in Cumuto the Sobratee Trace Mosque etc, The Council felt that the office of Mufti should not be left vacant as it has been since the demise of Moulvi Ameer Ali, our first Mufti. In our quest to fill this important office the Council selected Dr. Mohammed Ali Aziz, who was inaugurated to this office on the 23rd October 1988. It was our hope that this appointment would usher in a new Era in the activities of the League and inspire us to greater heights. However for some reason or other we have not been able to get off the ground. 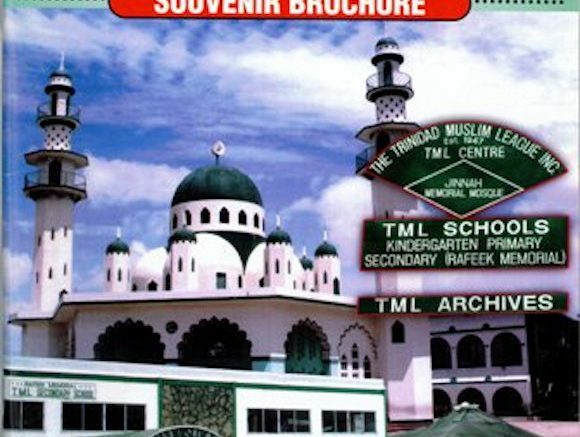 The Trinidad Muslim League took part in two major Muslim Conferences: The Rabita Conference of Saudi Arabia in March 1989 at the Hilton Hotel followed by the Muslim Conference of the World Islamic Call Society in June. Both these conferences called for closer Unity among Muslim Organisations. The Co-ordinating Council is currently working towards this end. There is a lot of work to be done to harmonize our own affairs. There should be closer links with our members in outer districts. Our Teachers’ Conference is coming up shortly and we should have fixed ideas to project. We should have an Imams’ conference and an Imams’ Council. Visits should be paid to our Masjids on a regular basis and many more such activities in order to cement relations. I would like to compliment all our Imams who are “holding on” at the various mosques and keeping their Jamaats together and also to compliment our young men and women who are giving Arabic lessons , and religious instruction at the TML Centre and in other districts. We have fixed assets of over three million dollars, and we must place responsibility in the hands of those who of necessity will some day occupy our positions. Before I take my leave I would like to stress that we must provide every facility to attract our youths to participate in the League’s activities. We must devise appropriate strategies to keep our young members together by providing recreational facilities to begin and from there on we can move forward. The participation of our female members is an essential ingredient in the advancement of the League’s affairs. They have already proven their worth in the past; they must now take the lead and show their male counterparts that they have the initiative and wherewithal to advance the League to greater heights. INSHA ALLAH. We Thank Allah for his Guidance and Beneficence. Thank You Sisters and Brothers. Be the first to comment on "A HISTORICAL REVIEW OF THE TML"